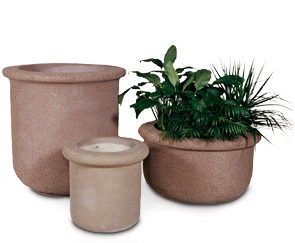 Add greenery and character to your facility with these round concrete planters. The steel reinforced concrete construction gives these planters extreme durability and minimizes maintenance making them the perfect solution for outdoor landscaping. The substantial weight of concrete naturally discourage theft, and also makes the planters strong enough to support even large root systems. Comes standard with drain holes at the bottom to provide proper drainage. Available in three different sizes, choose from multiple colors and finishes to create the perfect planter for your site.